Give your new 2014+ BMW 2 Series a new carbon fiber accent with this vacuum formed carbon fiber performance style trunk spoiler. We manufacture these trunk spoilers from full carbon fiber which not only presents a great looking product but will also fit better due to its' properties. This F22 carbon fiber trunk spoiler fits all 228i and M235i coupe applications. Installation is a breeze and can be done by any enthusiast. Our trunk spoilers have 2x2 carbon fiber weave designed to match any other carbon fiber exterior accessories. All that is required is 3M double sided tape (not included). 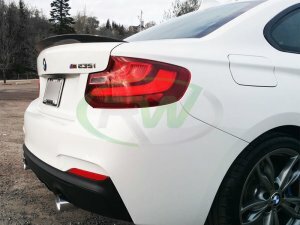 Boost your rear end appearance with this Performance Style BMW F22 2 Series Carbon Fiber Trunk Spoiler from RW Carbon.